One of the reasons I believe seminarians need extensive training in mystical theology in our times is precisely because of all the spiritual frauds and their delusional devotees running around parishes and the archdioceses of the world these days. Last week I came upon a post on mysticism and discernment written by a British Third Order Carmelite priest who claims to be an exorcist – (whenever he speaks to anyone it seems he makes this fact known) – in addition to being a mystical theologian. His name is Fr John Abberton. Fr. Abberton may indeed carry all of those credentials, but he has a lot of baggage on top of that – he promotes the false visionary: Vassula Ryden. The CDF issued the following Notification on Vassula Ryden – who some say is more an occultist than mystic – as far back as 1995. Fr. Abberton goes to great lengths trying to explain away the notification, but his arguments are less than convincing, if not without authority. A calm, attentive examination of the entire question, undertaken by this Congregation in order to “test the spirits to see whether they are of God” (cf. 1 Jn 4:1), has brought out — in addition to positive aspects — a number of basic elements that must be considered negative in the light of Catholic doctrine. Among other things, ambiguous language is used in speaking of the Persons of the Holy Trinity, to the point of confusing the specific names and functions of the Divine Persons. These alleged revelations predict an imminent period when the Antichrist will prevail in the Church. In millenarian style, it is prophesied that God is going to make a final glorious intervention which will initiate on earth, even before Christ’s definitive coming, an era of peace and universal prosperity. Furthermore, the proximate arrival is foretold of a Church which would be a kind of pan-Christian community, contrary to Catholic doctrine. Given the negative effect of Vassula Ryden’s activities, despite some positive aspects, this Congregation requests the intervention of the Bishops so that their faithful may be suitably informed and that no opportunity may be provided in their Dioceses for the dissemination of her ideas. Lastly, the Congregation invites all the faithful not to regard Mrs. Vassula Ryden’s writings and speeches as supernatural and to preserve the purity of the faith that the Lord has entrusted to the Church. I believe that has been the same assessment on the messages of Fr. Gobbi to the Marian Movement of Priests [MMP]; not surprisingly, Fr. Abberton is also a member of MMP. I write as a priest who has had over twenty-five years experience as a spiritual director of a mystic soul. Some who read this may want to ask how I know she (Ryden) is a mystic. The answer is that according to the usual rules of discernment in these matters, and through my own experience, and the experiences of others who know her, along with the general acceptance of those who have read her writings that she has not deviated from the teaching of the Church, my considered opinion is that she is genuine. A priest who gained his doctorate in a specialised study of mysticism agrees with my judgement, and she was accepted as genuine by a bishop who told her that he had never really understood the “Song of Songs” until he had read her writings. I do not mention this lady [?] to distract from Vassula but in order to show that I have some knowledge and experience in these matters. -> Omissions? Blank pages? Changed Messages? Fr John Abberton is ‘the’ Catholic apologist for the occult ‘seer’ Vassula Ryden. Yes, there’s only one Catholic priest in the UK who speaks up for TLIG – just do a Google search and you’ll see what I mean. As such, Abberton is completely ignoring the CDF’s instruction on Catholics keeping a distance from this woman and her dangerous ‘ecumenical’ sect. -> Medjugorje – Genuine or Hoax? -> Vatican City, 6 October 1995. Yet Fr. Abberton seems to devote a great deal of effort spreading these messages through his website, blog, and any other web opportunity which presents itself – around the world. Unsuspecting Catholics pick up his writings, post what sounds good, and then link to his site. The errors are thereby spread. Whenever there is a valid question of error or vanity, self-will and pride, one cannot be certain the Holy Spirit is guiding the effort. Even more so, when anyone acts in opposition to official Church teaching – in this case, a notification from the CDF – one cannot be assured that the other person’s doctrine is orthodox, no matter how well educated the person may be. Watch out for frauds and deceivers and their cults. Many thanks to Diane at Te Deum Laudamus blog for the source material regarding the notification. 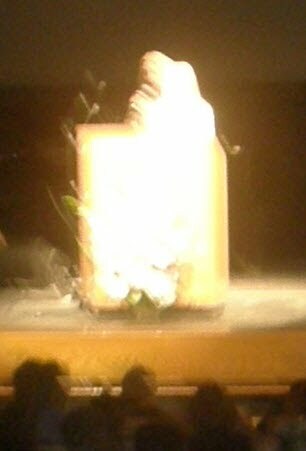 Photo: One Clothed with the Sun Appears Enshrouded in effulgent light in Front of Vassula Ryden during a talk she gave on January18, 2009. There are many doctrinal errors in Vassula’s writings cited by some very good and reputable theologians (and some things were altered according to Fr. Pavich, who proved this out… why?). Couple this with what is actually in the Holy See’s explanations from 1995 and 1996, and it should give people adequate reason to spend their time reading things like the life of Catherine of Sienna, Teresa of Avila’s Way of Perfection, the story of Bernadette, Sr. Lucia’s memoirs, the Confessions of St. Augustine, the Devout Life by St. Francis de Sales, etc. Reading the biographies and writings of lesser known saints can be an exciting journey, such as Don Bosco’s Forty Dreams, or the life of the young St. Dominic Savio as written by Don Bosco. Don’t spend precious time on questionable and controversial alleged private revelations. In the case of Vassula Ryden, the Holy See was clear that these were not from God, but personal meditations (which contained doctrinal errors). Read the Vatican documentation your self and see. First of all, I refer you to a book published recently on “Christian Prophecy” by Niels Christian Hvidt, a lay-theologian. The foreword is written by Cardinal Ratzinger who knows Hvidt – and knows he is involved with Vassula. In fact Vassula is mentioned in the book in a favourable light. It was Cardinal Ratzinger himself who answered two South American bishops regarding the Notification, and he also gave an interview with the Italian magazine “30 Days” (I expect you will find the reference if you search it) in which he said that the Notification was not a condemnation. Actually it could not be because there was no canonical process. He described it as a “warning”. After Vassula gave her answers to the questions posed by the Notification, with the aid of Fr. Prospero Grech who has worked for the CDF, Cardinal Ratzinger called her answers “useful clarifications” and said that the CDF response would be “modified” (all this is naturally on record). He also insisted that her answers be printed in one of her books – thus showing that if anyone wanted to see them, they would have to get a book. Hardly the thing to do if you want to dissuade people from reading them! (Again this is on record). As regards the Notification itself and the timing of it, the late Fr. Michael O’Carroll was on his way to Rome with a dossier he had compiled. He did not present it before the Notification was issued. A Brazilian bishop (I can provide reference to his talk on video) who worked in the Pontifical Biblical Institute and knew the Cardinal asked him personally what he should do about Vassula’s writings since he had gained so much from them. He was told, “Don’t worry. All is well” and that he could carry on as before. Dear Father: what spiritual good does it do for my soul to spend time on her personal meditations over the works of St. Teresa? Or St. Augustine? Or the memoirs of Sr. Lucia of Fatima? Wikipedia has a good review of this matter: http://en.wikipedia.org/wiki/Vassula_Ryden. It is clear that the Vatican does not approve of this business. …As I have tried to show, the “Vatican’s” viewpoint is not as simple as some believe. The information I gave is correct. If the CDF is so against Vassula, why does the Pope allow a book to be published with his foreword in which Vassula’s case is put quite favourably (by this I mean allowing for the possibility that she might be viewed favourably)? Why would he insist on Vassula’s answers being printed in her books if he felt that people should not read them? Why tell bishops they can continue to read them? Why remind us that the Notification is NOT a condemnation? You said: Why is it – may I ask – that many people assume that the negative view is the correct one? Why assume that the positive is not correct? If you are referring to the doctrinal assessment, which to me is the most important of all, then it is the CDF that is correct. A calm, attentive examination of the entire question, undertaken by this Congregation in order to “test the spirits to see whether they are of God” (cf. 1 Jn 4:1), has brought out-in addition to positive aspects – a number of basic elements that must be considered negative in the light of Catholic doctrine. You want me to take your word, your view, your assessment, your experience, over a document from the Congregation for the Doctrine of the Faith, which has repeated its doctrinal position? The doctrinal assessment of the writings stated that, a number of basic elements that must be considered negative in the light of Catholic doctrine. When I see the Holy See change its position in the form of a notification, with a protocol number, which matches your view, then it may warrant my attention for a closer look. Until then, there is a treasury of writings worth consulting which are approved and doctrinally sound. If I never watched TV again, I could not get through them all. In general, I have a problem with a priest who claims to be a diocesan exorcist, and who would publicly disagree with a notification by the CDF. If the case continues to be worked on, why do you then not work discretely? Why not suspend “defending Vassula” as you work discretely with the Holy See on your arguments? When, and if, they reverse what remains of what is negative in their findings, then by all means promote it. But to openly and publicly contradict the Holy See on doctrinal points, as seen in this article at the “Defending Vassula” website, is wrong. Those advancing these kinds of arguments publicly, at this stage, given the notifications to date by the CDF, have become their own “magisterium”. With regards to the last comment about exorcists that I made, it appears that you have somehow misunderstood what I said. You seem to think I was speaking about you, but you cannot know about whom I was speaking. I have never encountered you or any of your writings before today so I have no idea what you have said publicly beyond what is here and in the links provided. This post caught my eye because prior to my defection from (and more recent subsequent return to) the One True Church, I remember my aunt being very interested in Vassula and her writings. She bought us some of the volumes, and although I read them I always held them at arms length “just in case”. Terry, WOW! You lit the “proverbial” H-bomb here! I have stayed clear of V. Ryden since E. Michael Jones’ articles; if the Vatican says there are “problems”, then that’s good enough for me, they will settle the matter. I must confess that the “automatic writing” business (or whatever is involved here) is a big problem for me. The connection with Medjugorje is also a big problem; I know, I know, there is a commission in the Vatican working on this, etc. I still have a problem with M. and it boils down to the documented disobedience and lies of the seers. Again, Rome will sort this out. The Notification is still valid, but as a “warning” (Card. Ratzinger’s word) A warning is NOT a condemnation. Card. Ratzinger told bishops they could continue reading Vassula’s writings. We have this in print and on video. This means that your very strict interpretation of what the CDF is saying is wrong – otherwise the Pope is wrong. Are you disagreeing with the Pope? …Videos and other letters, notes, etc., without a protocol number, which are not made plainly visible by the Holy See on such an issue, is no substitute for official word from the same Holy See. This is not “strict interpretation” when I accept the Holy See’s doctrinal assessment as valid, and the “Defend Vassula” website publicly does not. [T]he Holy Synod of the Greek Orthodox Patriarchate of Constantinople issued a strongly-worded decree denouncing Vassula Ryden and her works, excluding her supporters from (Orthodox) communion, and warning people from spreading her teachings her lest they incur canonical censures. In this spirit, and for the beneficial protection of our pious Orthodox plenitude from dangerous spiritual confusion, who do not know well matters underlying the risk of delusion, rejects from the Mother Church Vasiliki Paraskevis Pentaki – Ryden, widely known as a “Vassula”, and her organization founded under the title “True Life In God” which rashly and frivolously proposes teachings based on the supposed “direct dialogue between her and the Founder of the Church Jesus Christ our Lord”, and those conquered by her and the supporters of “True Life In God”, which deviate arbitrarily from the God-given teaching of the Church, but also scandalize the Orthodox phronema of pious believers. I wrote about Vassula Ryden before [see pages 1, 2] and got some flak from a couple of her supporters, one a well known priest. Many of these people appear to be obedient yet they are adamant in their devotion of the seer and seem to be reluctant to accept the judgement of the Church in these matters. What did I say the other day in another post about priests and bishops who look the other way when it comes to dubious revelations and apparitions? They often dismiss the critics saying, “Well, as long as people are praying and going to Mass.” In some cases there are theologians, priests* and bishops who go along with the visionaries and promote their causes – despite the fact other bishops and Church congregations issue warnings that the movements are not supernatural, and may be false and even dangerous. Another situation is scheduled in the St. Cloud Diocese in the next week or so. Outside of St. Cloud, Minnesota, in Sauk Centre is a House of Prayer established by the followers of Christina Gallagher, the Irish mystic whose work and revelations have been denounced by her Diocesan Bishop in Ireland. Yet she is allowed to promote her messages in the St. Cloud Diocese. These messages play to the mistrust and fears of gullible Catholics who look to Christina Gallagher as a stigmatic in direct contact with the Blessed Virgin. See their website here. I spoke with the chancery in St. Cloud and the chancellor, Fr. Rolfes told me he saw nothing against the faith in their prayer meetings, and that Gallagher’s priest-advisor is a priest in good standing. He is also aware of the problems Gallagher has had with her Bishop. The chancellor told me he intended to be present at the next meeting to see that everything was orthodox. That’s a good sign – I think. Nevertheless, I’m always a bit surprised how promoters of such visionaries seem to be very skilled at explaining away CDF notices and episcopal condemnations in order to find loop holes for people of good faith to follow along and join the cult – and donate. The practice has been tolerated with the Medjugorje phenomenon for decades. *One defender of Vassula Ryden, Fr. John Abberton is very busy refuting all the claims against her. It’s pretty amazing. I’m sure devotees and followers will not be deterred by this news however. Topic: The heretical positions of Vassiliki (Vassula) Pendakis-Ryden. Over the last few days Vassula Ryden has been appearing in the media, giving lectures and trying to come into contact with bishops and priests, giving the impression that she presents and teaches the Orthodox Christian faith. In reality, her teachings are heretical, and her claims that she communicates directly with Christ are fantastical and outside of the spirit of the experience of our Church. The Orthodox Church, following strictly the shining example and teaching of the Holy Apostles, the teaching of the Fathers of the Church who have their succession, and the divinely-inspired decisions of the Ecumenical Synods, safeguards as a pearl of great price the faith of the One, Holy, Catholic and Apostolic Church which the Christian plenitude experiences through their participation in the Sacraments and entire spiritual life of the divinely-founded ecclesiastical body. Hence, whatever movement and improvised tension, personal or collective, in contempt or in breach of the dogmas of the Orthodox Christian faith and life in Christ within the Church as the only path for the salvation of our souls, all the more the self-proclaimed “supposedly charismatic” personality, is rejected always as an unacceptable innovation. In this spirit, and for the beneficial protection of our pious Orthodox plenitude from dangerous spiritual confusion, who do not know well matters underlying the risk of delusion, we denounce from the Mother Church Vasiliki Paraskevis Pentaki – Ryden, widely known as “Vassula”, and her organization founded under the title “True Life In God” which rashly and frivolously proposes teachings based on the supposed “direct dialogue between her and the Founder of the Church Jesus Christ our Lord”, and those conquered by her and the supporters of “True Life In God”, which deviate arbitrarily from the God-given teaching of the Church, but also scandalize the Orthodox phronema of pious believers. Hence, we call upon the proponents of these unacceptable innovations and the supporters who maintain them, who henceforth are not admitted to ecclesiastical communion, not only to not be involved in the pastoral work of the local Holy Metropolis, but also to not preach their novel teachings, to prevent the appropriate sanctions under the Holy Canons.